Despite the lack of interest surrounding today’s “UFC Fight Night: Hunt vs. Bigfoot” event, you can’t complain too much about Octagon action when it’s live and free. If you would like to make the fights a little more interesting, we know just the trick. 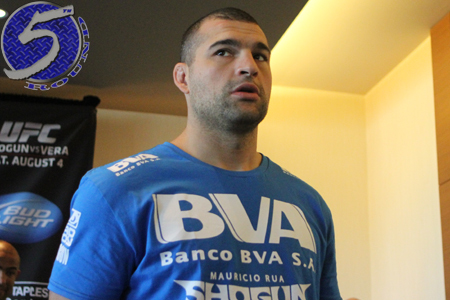 Antonio “Bigfoot” Silva and Mark Hunt meet in the show’s featured contest, but perhaps the most compelling bout on the card is the co-main event between former light heavyweight champion Mauricio “Shogun” Rua (pictured) and James Te Huna. With a third straight loss, UFC president Dana White has said he might have a chat with Shogun about retirement. Shogun is an even-money (+100) underdog against, while Te Huna checks in as a slight -130 odds-on favorite. Brisbane Entertainment Centre in Brisbane, Australia hosts today’s fights.